A series of events which began in 1854 changed their lives. Bernadette's father was falsely accused of stealing two sacks of flour and was imprisoned for many days. There was a drought which lasted for two years and drastically affected the wheat harvest and work at the mill. And finally, the steam mills that resulted from the Industrial Revolution put Francois' mill out of business, and he was out of work. The family was reduced to living in a one-room dwelling called the Cachot, which was formerly used as a jail. During this same period Bernadette contracted cholera. The high fevers caused her to suffer physically the rest of her life. She suffered emotionally also. She felt the heart ache of being excluded as people pointed to her family as the ones who live in the Cachot. Her physical illnesses prevented her from going to school. At age 14 she spoke only the dialect of Lourdes. She was unable to read or write or speak French, and the Catechism was taught in French only. She went to Mass, but she was not allowed to receive Holy Communion with her friends. Sometimes Bernadette's only comfort was her mother's love. Later, Fr. Pomian prepared Bernadette for First Holy Communion. There was something about Bernadette that moved the Hosts of Heavenly Hearts. 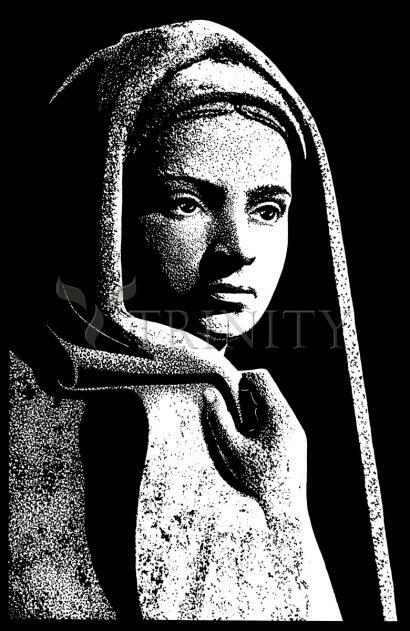 She was blessed with eighteen divine apparitions, and the world is forever changed and will never forget Bernadette. After dinner on the Thursday before Ash Wednesday, Bernadette's mother told her children that there was no more wood in the house. Bernadette and her sister, Toinette, and a neighbor friend, Jeanne Abadie, went to the river Gave to gather wood. They had to cross a canal of cold water. Fearing that she would have an asthma attack, Bernadette stayed on the bank, and the other two girls crossed the stream and picked up wood under the grotto until they disappeared along the Gave. Bernadette heard a great noise like the sound of a storm, but nothing was moving. She was frightened and stood straight up, losing all power of speech and thought. She turned her head towards the Grotto of Massabieille and saw in the opening of the rock a rosebush, one only, moving as if it were very windy. Almost at the same time, there came out of the interior of the grotto a golden-colored cloud, and soon afterwards, a Lady, young and beautiful --exceedingly beautiful -- the likes of whom she had never seen, came and placed herself at the entrance of the opening above the rosebush. She looked at Bernadette and immediately smiled and signaled her to advance, in a way that a mother motions her child to come near. Bernadette took out her rosary and knelt before the Lady, who also had a rosary on her right arm. When Bernadette tried to begin saying the rosary by making the sign of the cross, her arm was paralyzed. It was only after the Lady had made the sign of the cross herself that Bernadette was able to do the same. As Bernadette prayed the rosary, the Lady passed the beads of her rosary between her fingers, but remained silent. She did recite the Gloria's with her, however. When the recitation of the rosary was finished, the Lady returned to the interior of the rock and the golden cloud disappeared with her. Bernadette told her sister of the extraordinary things that had happened to her at the grotto, asking her to keep it a secret. Throughout the day the image of the Lady remained in her mind. In the evening at the family prayer Bernadette was troubled and began to cry. When her mother asked what was the matter, her sister told her everything. Bernadette's mother told her that these were illusions, and forbid her to return to Massabieille. "She has the appearance of a young girl of sixteen or seventeen. She is dressed in a white robe, girdled at the waist with a blue ribbon which flows down all around it. A yoke closes it in graceful pleats at the base of the neck. The sleeves are long and tight-fitting. She wears upon her head a veil which is also white. This veil gives just a glimpse of her hair and then falls down at the back below her waist. Her feet are bare but covered by the last folds of her robe except at the point where a yellow rose shines upon each of them. She holds on her right arm a rosary of white beads with a chain of gold shinning like the two roses on her feet." On Sunday, Bernadette's mother allowed her to return to the grotto.